September | 2011 | seedLinG! What is the meaning of “to educate”? To educate means to provide an environment that is safe for experimentation and creation, to provide children with rich learning experiences and opportunities through safe, high-quality materials and well-planned curriculum. To educate means modeling social skills and interactions, helping children understand who they are and how to learn self-control and intrinsic motivation. We also work directly with parents to form a strong bond between home and classroom, and to share our broad wealth of educational information to help parents better understand their roles in their child’s schooling—both now and in years to come. What is “childhood”? Childhood is a beautiful and magical time when everything helps to promote learning—not just about surroundings, but about self, others, relationships, and how the world works. It is a time when eagerness holds hands with curiosity, when everything is new, exciting and within the child’s grasp. How will a child learn to bake if we don’t give them the materials and chance to make a cake? How will a child understand that sand is tiny rocks if we don’t supply them with the sand to feel and experiment with? By using all of our senses, the memory becomes much stronger, reinforcing the learning experience. A highly-effective teacher honors and respects childhood and seeks to infuse it with beautiful opportunities and experiences. 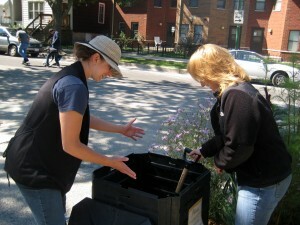 What: Learn about composting as we set up a new compost bin at Lucy Flower Park! Master Composter Lauren Warnecke shares info on urban composting that is fun, fascinating and hands-on. Lend a hand and learn as you go…we hope to see all interested families at Lucy Flower Park!